Open Doors asks us to pray. These are just four cases out of tens or even hundreds. We must pray! Reports of kidnappings and the forced conversion of Christian girls to Islam are common among Egypt's Coptic community. Only three months ago, Theresa Ghattas Kamal, missing since 6 January and feared kidnapped by a Muslim man, was found living with a Muslim family. Wearing the full veil, she told her brother that she had 'found the right path' - Islam. Please pray for these girls and remember the ones who go unnoticed. Ingy (top, right) disappeared the day after her 19th birthday. She was reportedly being held against her will by a Muslim couple, near Cairo, but police showed her family an alleged signed declaration of conversion to Islam. At a hearing on the girl's case, Ingy appeared in court dressed in an Islamic veil. Her family believe she was being given drugs affecting her moods, and her brother said she had spoken of suicidal thoughts. Marianna (bottom, left) left work to pick up a patient's blood sample but has not been seen since. The owner of the business next door told her fiancé that a Muslim employee of his had kidnapped the young woman. Rumours spread that she had converted to Islam, but her fiancé dismissed the claims, saying it was her close relationship with God that brought him to a deeper understanding of his own Christian faith. 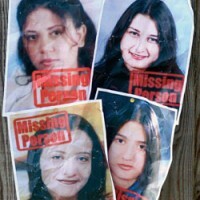 Heba (bottom, right) was last seen leaving work at a hypermarket in a suburb of Cairo. Staff said she had left as usual on the bus but later claimed she had resigned. Five days later the family received a letter stating that Heba had eloped with a Muslim man but when they contacted the man, he denied any knowledge of her whereabouts. The next day, a police source told Nabil Ghali that his daughter had converted to Islam. On 13 November, he acquired a copy of Heba's conversion certificate, dated 28 September. Three weeks after she went missing, Theresa (top, left) called her family, saying she was imprisoned in a Cairo apartment facing pressure to convert to Islam. Theresa's brother eventually found her living with a Muslim family. He was allowed to visit on 23 March when he sat with her for 90 minutes. She spoke only once to say, "I have converted to Islam. I have found the right path." Theresa's family insist that she was kidnapped, but some Christian girls romanced by young Muslim men voluntarily leave their families and convert to Islam to escape poverty and unhappy family situations. This is Stupid, who can force someone to change his beliefe !!!!. do you know what you're saying people ! this is never happen ! , this is an argument the Christian always say whenever someone convert to Islam, but you never hear that word on the western socity, please ask the people who convert to Islam, did anyone force you to do, and what is the result if i forced anyone to convert to any religion without a real beliefe !! is that a faith !!! this is crazy, I recommend u to remove this topic or change its title because it is not true ! Come on, these stories really seem so FAKE! LOL in agreement with Abdelrahman about the drugs thing. The only one that seems as if it *might* have a grain of truth to it is Marianna's story and even that is pure hearsay and no real evidence. The last story...give me a break. What real man would go and 'visit' his sister in a 'kidnapped' state and not raise all kinds of hell in freeing his sister? Why wouldn't the girl have taken the opportunity to leave with her brother instead of staying there as a 'forced' Muslim? This is all mostly rubbish nice try Christian fanatics but you fail. i m not a religious neither a fanatic and i respect all religions as we are heading to one direction" GOD THE CREATOR so there is no such a word call FORCE to convert to other religion.If u r being forced to be a muslim but only on ur tonque, no worry if in ur heart u still admit that u r a cristian than u r a cristian cos at the end of the day only THE ALMIGHTY can distinguish who u r.
Coptic girl, please know that our thoughts and prayers are with you and your families. We are also praying for those girls who have still not been found. I have read that only a few have been found, but thank God for those few at least. The truth of their story will come out more and more. as an egyptian, muslim lived in both places, egyp and u.s., every time a christian girl in egypt converts to Islam, the church fabricates a story of kidnap!!! in ur right mind, do u think u can force someone to change their religion, and marry u and lasts with us a lifetime against their will!! reason with urself for a moment please! well.I think this is most important for the parents to bring up their kids in the Spiritual enviroment so that they know that while choosing their life parner they give 1st piroity to their God no matter what great temptation they face they will choose to beat it, not reject their God and His Son Jesus Christ this happening more common bc our girls has no basic christian Education. We must pray as we have already started in our intercessory group bc we know we r accountable to all these issues even if we do not pray with tear and arrange specail messages for our Youth and children in the usual sunday services.God bless.